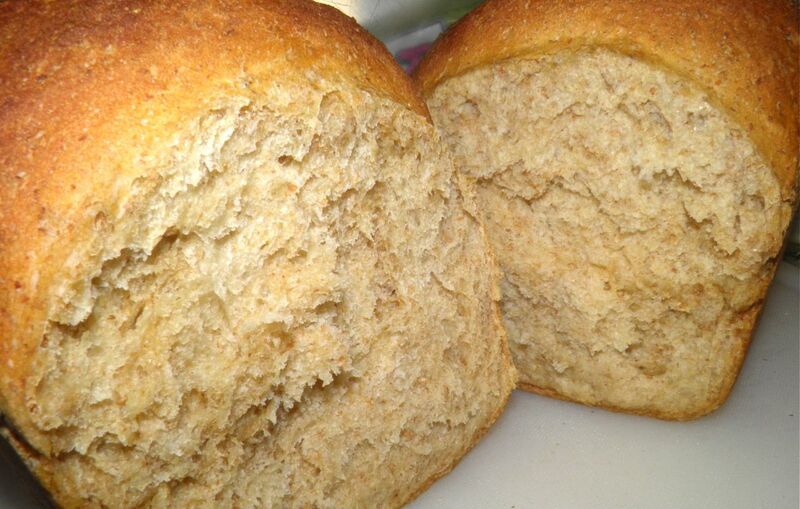 Does this look like the whole wheat bread in the stores? I think not. There’s one advantage to living in the country and working at home. You have plenty of time to make homemade bread. Well I do – as do you. This bread may take only three hours, but if you work the whole day you can let your bread rise slowly in the refrigerator. Or don’t proof your yeast first. Just mix it in dry and let it rise for the day (or overnight) on the counter. We all have time to make bread. I haven’t bought a single loaf of store-made bread since we moved to the country over a month ago. I believe we have almost constantly had bread, too. Good bread. Interesting bread. 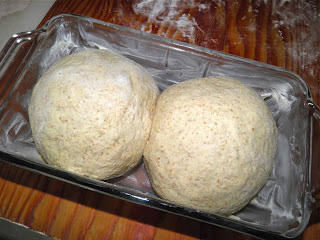 Ready for shaping & 2nd rise. 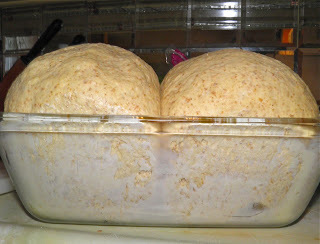 The last two loaves I made certainly fall into that category: whey bread and ancient grains bread. Click the names to see the recipes. 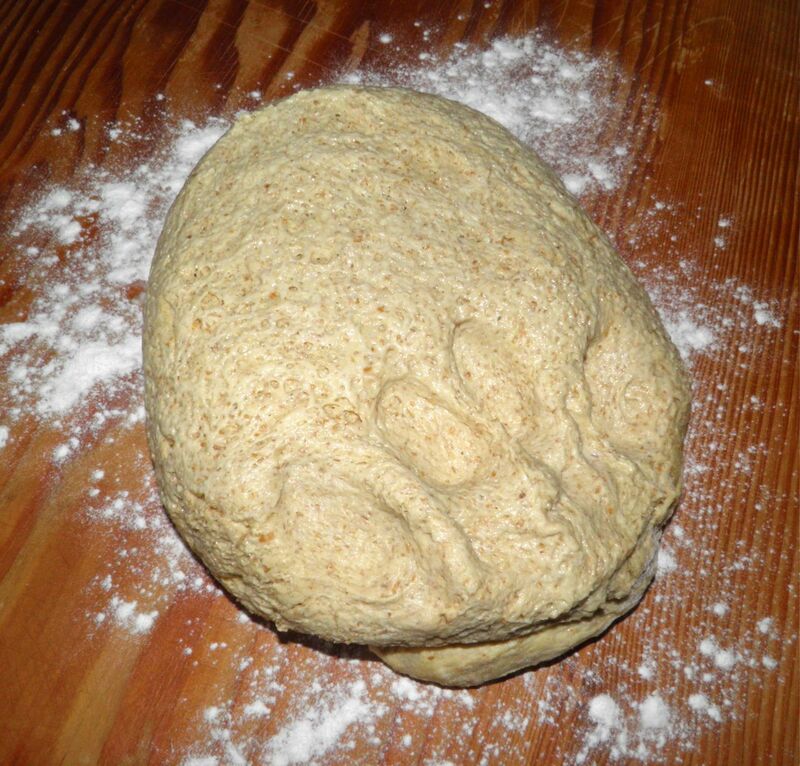 Whole wheat is exactly that – the whole wheat grain ground into flour. It hasn’t been processed to remove the bran and germ from the endosperm. The bran has fibre, the germ contains several essential nutrients and the endosperm (about 80% of each grain) is starch. “Refined grains” pretty much only have the starch. No wonder people say bread makes you fat. People who eat whole grains usually weigh less, and are less likely to experience some cancers, heart disease, strokes and diabetes. They also are less susceptible to iron deficiency – sometimes caused by eating too much refined flour. Here’s something I didn’t realize. Some multi-grain breads may not be any healthier for you. They may be made with many different grains (the "multi"), but if they aren’t whole grains you may as well eat a slice of white bread. Check your labels. I’m using unbleached flour now, and this time including whole wheat. Before the1800s all flour was milled and left to air dry for a few months. In the process the flour “bleached” naturally a little and proteins developed. Some people don’t like whole wheat. Have they ever had a slice of homemade? You can make 100% whole wheat bread, but the gluten level in whole wheat is less than in refined flour (because per volume it has less starch). So it’s best to mix the two in equal proportions, or a little heavier on the whole wheat. I also added 1/4 cup of molasses. Not only does it help feed the yeast during rise, but it also adds a bit of colour. The end result is a loaf just slightly lighter in colour than oatmeal brown bread. As I was writing this I was enjoying a slice, still warm, with butter melted on top. 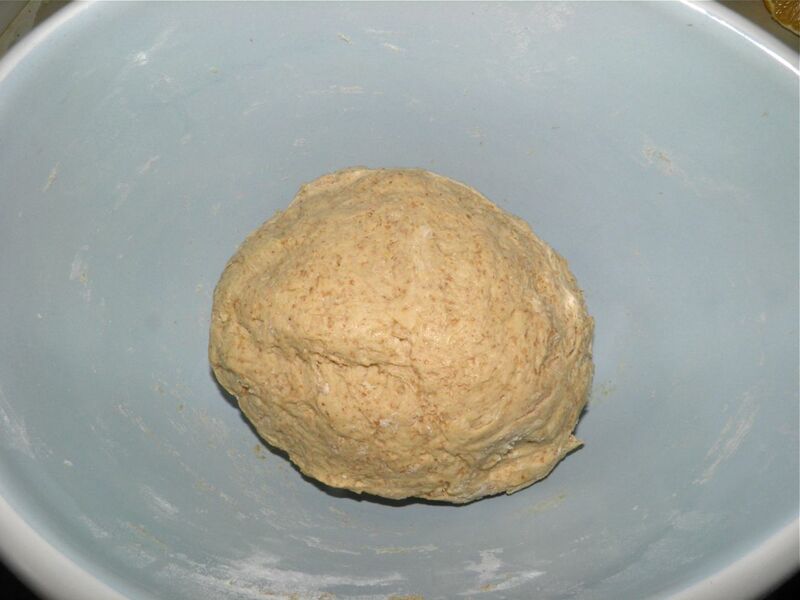 Place the warm water, molasses and yeast in a large bowl. Let sit until the yeast becomes creamy, about 10 minutes. Add the two flours and the salt. Mix until the dough starts to come together. 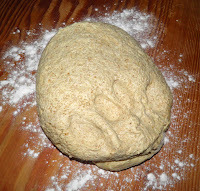 Then take your hand and knead for 2-3 minutes in the bowl. Clean your hands if the dough sticks to them and continue kneading. It will still be very wet. Only add more flour if absolutely necessary. Remember, this dough will be VERY wet. Wrap the top of the bowl with plastic wrap and a towel. let rise in a warm spot for 2 hours, until doubled. Punch the dough down and place it on a floured board. Knead a few times and then divide in two. Shape each piece of dough into a round ball by cupping the dough on the bottom and turning (Like you would if making rolls). Place the two balls side-by-side in a well buttered 5x9 loaf pan. Let rise again for 45 minutes. Preheat the oven to 450°F, with a pan of water on the bottom rack. Bake the loaf for 10 minutes. Then remove the water and bake for 20 minutes more, or until nicely browned on top and top sound hollow when tapped. Remove from the pan and let cool on a rack... slightly... at least until you can handle it.